includes four Bogged Down tokens, two Gone To Ground tokens, three Minefield tokens, four Anti-Aircraft token, one Ranged In tokens, two Foxholes tokens, four Bailed Out tokens and two Pinned Down tokens. 4x Bogged Down token; 2x Gone To Ground tokens; 3x Minefield tokens; 4x Anti-Aircraft tokens; 1x Ranged In token; 2x Foxholes tokens; 4x Bailed Out tokens and 2x Pinned Down tokens. 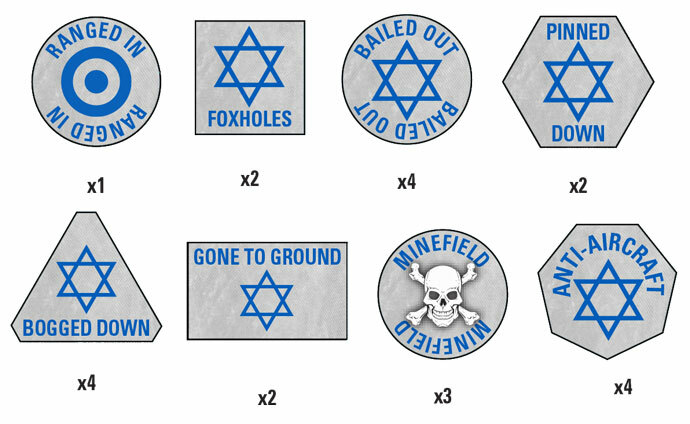 includes 20 Israeli themed gaming dice. A horrendous clang shook the entire Merkava 2 of Lieutenant Adam Koren. Koren’s ears rang and all other sounds were muffled. He searched ahead for the enemy tank that had just hit them, locating it about 2000 metres to the northwest. He slapped his gunner Avi’s shoulder to get his attention.“Target, 2000 metres, Sabot,” he shouted. Avi replied, but Koren couldn’t hear him. However, Avi acknowledged the order with a thumbs up before taking aim and sending a round towards the Syrian T-72M in the distance. Koren watched the T-72M as the round hit. For a few moments nothing happened, then a crewman scrambled from the turret just seconds before a funnel of flame erupted from the hatches. Koren immediately began searching for another target. His loader, a new boy from Tel Aviv called Ezra, had already shoved another Sabot round into the breach of the gun, with Avi ready for the next target. Note: The Star Of David on each die represents the 6.